This bench has an adjustable back that can be altered to suit your workout routine or regimen. Its secure sawtooth back pad adjustment design that can be altered to an incline, flat, or decline position. This multiple seatback positioning allows strength training exercises such as crunches and weightlifting. You can use this bench to lift dumbbells and barbells or performing tool-free exercises such as sit-ups. You can also perform leg curls and other muscle-toning routines on this training equipment in order to sculpt your legs to match your toned upper body. This sleek black bench’s foam roller pads have a vinyl covering and a hardwearing, powder-coated finish. It also has a convenient transport handle. Additionally, this training device is suitable for the whole family, so everyone can use it to improve their bodies and health. 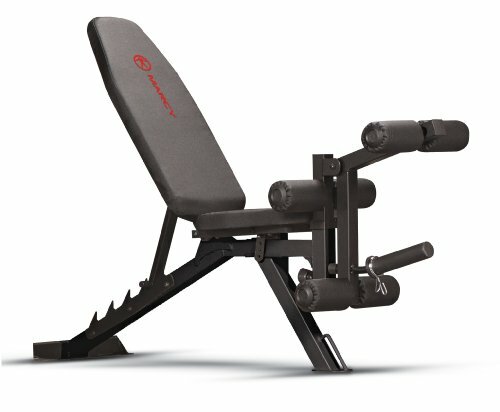 The ergonomic bench’s dual position leg developer has a two-position padded bar and weight posts that let you do leg extensions and curls. You can strengthen your calves and hamstrings, sculpt your quads and glutes, and gain a leaner figure through this helpful feature. The bench’s powder-coated steel frame offers great resiliency with a maximum weight capacity of 300 pounds. It is strong and sturdy so you’ll be able to pump iron at home for years to come. This bench is designed to fit most standards racks, cages, and Smith machines. Work out with optimal efficiency and without worrying about the training equipment’s construction. Its top grade high density foam padding allows users to exercise comfortably on the equipment, boasts exceptional durability, withstands pressure, and is guaranteed to resist heavy lifting. Target your oblique and abs without any hassle. Gain a better body in the comfort of your own home with the Marcy Utility Bench SB-350. 6-POSITION ADJUSTABLE BACK PAD - This utility bench has an adjustable back that can be altered to suit your workout routine. It features a secure sawtooth back pad adjustment design that can be modified to an incline, flat, or decline position. TOTAL LEG DEVELOPER - You get to train not only your upper body, but also your lower limbs thanks to this ergonomic bench's dual position leg developer. HIGH-DENSITY FOAM PADDING- This bench's top-grade foam paddingallows users to exercise comfortably on the equipment. Durable Construction - The Marcy Utility Bench's powder-coated steel frame provides great resiliency, with a maximum weight capacity of 300 pounds. COMFORTABLE FOAM ROLLERS-The foam roller pads have a vinyl covering and a hardwearing, powder-coated finish. This sleek black bench also has a convenient transport handle and wheels.